9 What’s in the box? 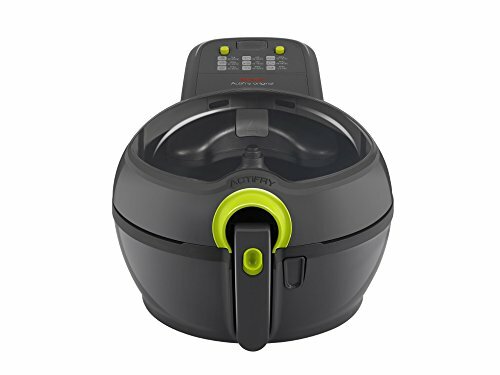 Welcome to this review of the Russell Hobbs, 20810 Purifry health fryer. 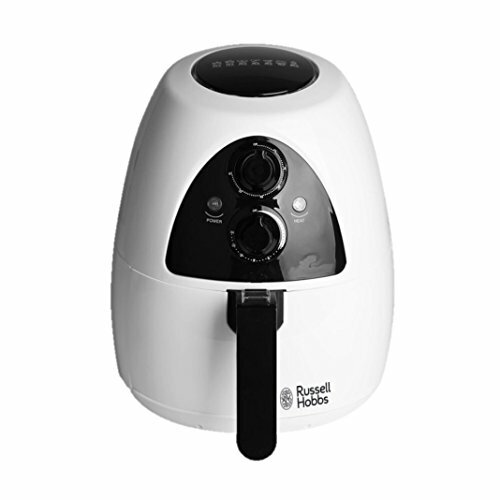 Russell Hobbs is a household name in the UK having been a popular brand for many years. Unlike other brands, they only have one low fat fryer in their range but that’s not to say it doesn’t deserve to be considered in our recommended top ten. The 20810 Purify is a mid-range option and although it may not be suitable for larger families, it would ideal for 2-4 servings. In terms of look and style, there is only one colour option, and that’s white, but with the gloss black inserts and black handle, it has a stylish finish which will blend in to most kitchens. The dimensions on the unit are: 28.5 cm x 35.5 cm x 38.8 cm which doesn’t make it the largest fryer we’ve reviewed, but it’s certainly not the smallest either. It weighs 6kg and has a power rating on 1230 Watts. Unfortunately in our opinion, there’s no rotating paddle on this machine, so you are advised to remove the basket during the cooking cycle and give it a shake. We wondered what results we’d get if we didn’t bother doing this and we ended up with chips which were brown on one side and hardly cooked on the other. 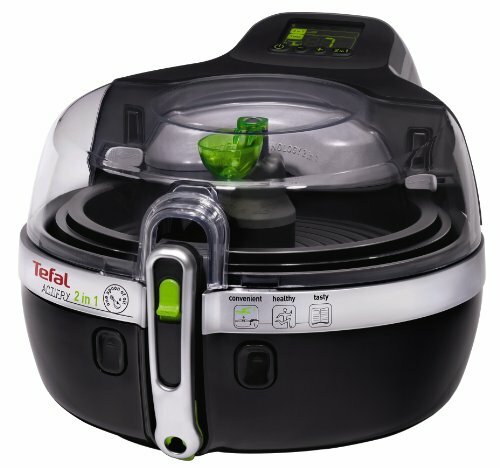 If you like to ‘set and forget’ when it comes to cooking then you might want to consider the Tefal ActiFry Plus which has the rotating paddle and automatic shut-off. We love the simplicity of the Purifry, it’s really easy to setup and use. 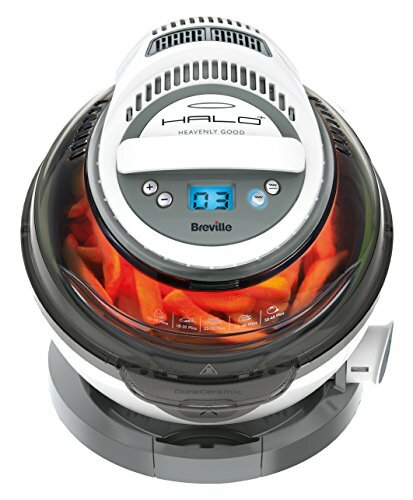 Turn it on, set the temperature (up to 200 degrees) and wait about 5 minutes for it to warm up. Place your desired food into the food basket and then set your timer (up to 60 minutes). In our chip test, we did remove the basked halfway through to give it a shake as per the instructions although this isn’t absolutely necessary – it just helps to prevent the food from sticking together. A full basket of chips were cooked perfectly, crispy and golden in 20 minutes. 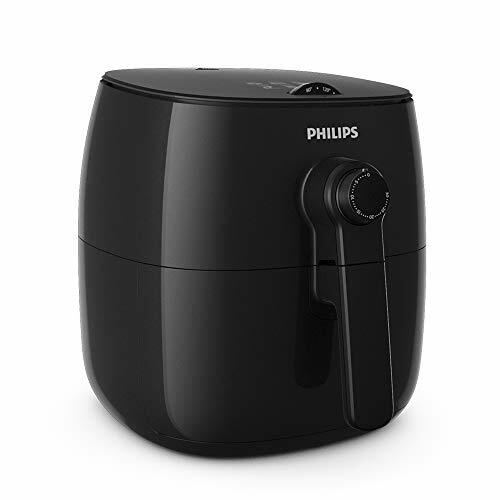 As a first time user of an air fryer, you might be tempted to use more oil than is recommended, but do follow the instructions for the best results and you’ll be pleasantly surprised how good your food comes out of the fryer. The food basket, which has a 2 litre capacity, can be divided into two, allowing you to cook 2 food items. 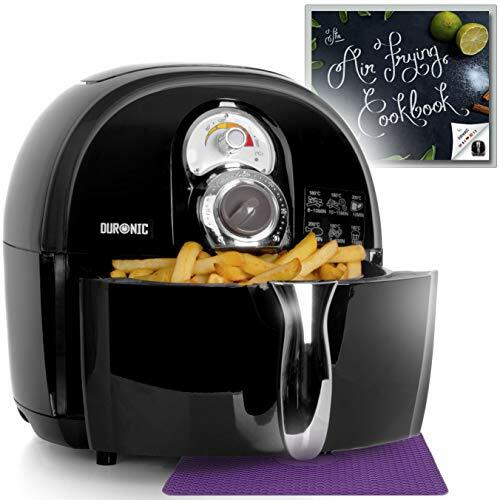 Great for cooking chips and for example battered fish, although there are many more food combinations to try. Cleaning the Purifry afterwards is simple and you can either use a damp cloth to wipe down, or if like us you’re lazy(! ), simply add the removable parts into the dishwasher. Fried food using the Purifry is a much safer option than deep fat frying, not to mention the health benefits of doing so. It’s 2 litre capacity is more than enough to serve up to 4 people. In the box you’ll find the unit itself, food separator and instruction booklet. We were disappointed there was no free recipe booklet included especially this being mid-range in terms of price. Having said that, take a trip to your local library or look online and you will find plenty of low fat frying cooking books to choose from. Taking a look at customer feedback for the PuriFry, it has an average rating of 4 out of 5, with many customers reporting how impressed they were with the results, not just for cooking chips but for also soups, porridge, hot chocolate and Indian dahls. Overall, the Russell Hobbs PuriFry 20810 is a decent. 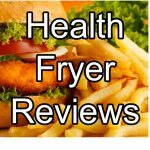 We can’t rave about it because for the money there are other low fat fryers we’ve reviewed that perform better. However, if you’re willing to persevere and experiment with the PuriFry, you’re likely to get excellent results.